We’re leaving before the sun even considers coming up tomorrow and won’t really have time to think about breakfast before we have to hit the road. I know I’m never happy with just a granola bar, and stopping for fast food breakfast costs money and takes time. So tonight, I took a few minutes and I made a yummy reheatable breakfast for tomorrow! 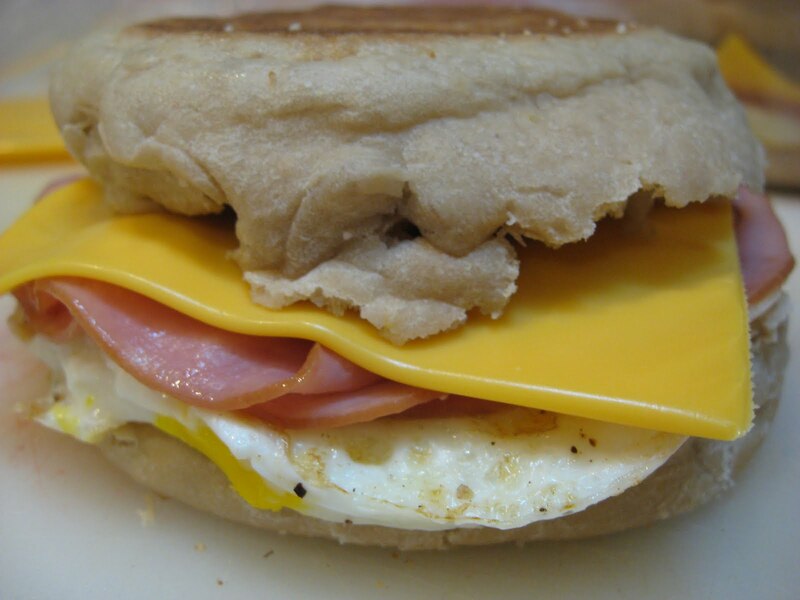 It’s the easiest thing ever – just English Muffins, eggs, ham, and cheese. It’s best with nice sharp cheddar, but I only had Kraft singles on hand, which is why you see that unnatural yellow layer in my sandwiches. I fry the eggs, trying very hard to keep them restricted to a small round footprint in the frying pan so they won’t flop over the sides of the English muffins later. I assume it’s much easier with a silicone egg-ring, but I haven’t gotten around to buying one yet since I don’t make these often. I sprinkle them with salt and pepper as they cook and then I plop them onto English muffin halves. I added a few ham slices and a slice of cheese, and stuck them into a plastic container in the fridge for tomorrow morning. They only need about 25-30 seconds in the microwave to get melty and delicious. When I’m making them for immediate eating, I heat up the ham in the pan while the egg cooks beside it, and then layer it on top. I put the cheese on top of that and let it melt a tiny bit before transferring the whole thing to an English muffin. That way everything is melty and delicious without the need for a turn in the microwave. This entry was posted in Uncategorized on May 13, 2011 by antijen.